Researchers from Washington State University have discovered how plants respond to disease-causing organisms and how they protect themselves. The results of their research, published in the journal Plant Physiology, could have major impacts on the way we breed plants to have resistances to certain diseases or pests. The key to plant immune system responses rests in ATP, adenosine 5-triphospate. Not only is ATP an essential part of cellular biology and metabolism inside of cells, the complex organic chemical may also act as a warning messenger outside of cells in plants. When ATP is outside of plant cells it behaves very differently than usual and becomes a sort of warning alarm, triggering the plants immune system response. Mapping the ATP pathways in plants is no easy task. To do, the team would trigger an immune response in plants in order to trace the signal’s path all the way to chemical receptors. “It was like following a single noodle in a huge bowl full of them,”said Jeremy Jewell, lead author of the study, “Extra-cellular ATP turns on defense responses partly through these major defense pathways, and partly independently of them, but all these strands work together. 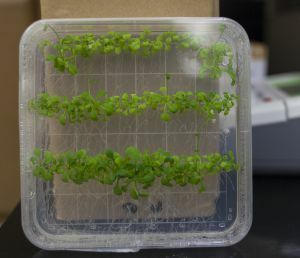 Better understanding how plants defend themselves from disease will be particularly helpful for researchers and farmers trying to grow plants which are resistant to certain types of diseases or pests. Having the blueprint for plant defenses takes some of the guesswork out of this kind of research. WSU David Gang compared the process to fixing your car.